Hospital volunteer. Become a hospital volunteer in Yakima. Volunteers at Memorial unanimously agree: it's a rewarding experience that gives people from all walks of life the opportunity to really make a difference. From acquiring new skills or building friendships, our friendly, helpful and compassionate volunteers feel good about helping our patients and families. Volunteering has a rich history at Memorial, starting in 1948 when the first guild members began fundraising to meet our communities need for a new hospital. Today, volunteers are an integral part of the staff. They work with Memorial employees to enhance the service and hospitality given to patients, families and visitors. We encourage you to meet our volunteers and find out more about the benefits of volunteering at Memorial. Over 380 active volunteers serve in approximately 80 volunteer positions in 68 different departments. 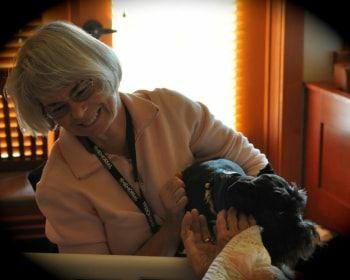 Our Paws2Hearts program serves at Virginia Mason Memorial Cottage in the Meadow, North Star Lodge, and Children's Village during Memorial's Kids Grief Workshop. Our Paws2Hearts Team is made up of 8 volunteers and their certified pets. Each handler and pet goes through extensive training through Love on a Leash, a nationally recognized pet therapy training program. 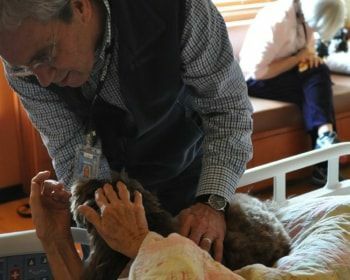 Once the handler's and their pets become certified, they spend 6 months out in the community serving at Nursing Homes, Assisted Livings, etc. as well as providing a letter of recommendation, taking Hospice Volunteer Training and interviewing with Paws2Hearts team members and the Manager of Volunteer Services before becoming a member of the Paws2Hearts Team. If you have additional questions about this program, please call 509-575-8053.